The Gluten Free Photographer: Gluten Free Gripe! I'm so aware that I haven't blogged in quite awhile. Apologies for my absence. Reasons being that I have been plagued by the flu and colds various and to top it off, I had to contend with an unfortunate neck injury which stemmed from my back trauma from last year. Literally a pain in the neck. I seem to be back to my healthier self, but I won't speak too soon! However, during this window of calm, I thought I'd finally put up a new post. What about Ireland? I took part in a recent #GeniusChat http://twitter.com/GeniusFoods on twitter - they who produce that tasty gluten and wheat free bread we all know and love, a little while back and they announced a new online shop with accompanying new products. I enquired as to whether they will be able to ship to Ireland or even have availability of their new products here. In a word, no. However, they do have plans to launch their expanding range here soon. 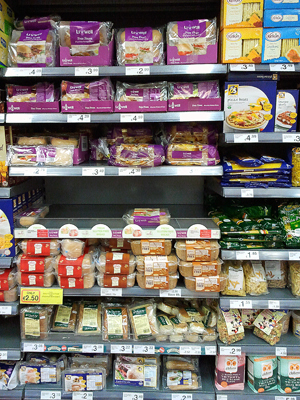 This seems to be the trend with UK free from food companies I have come across and is not the only time that I've encountered discrepencies between the UK and Ireland for availability and variety of gluten free food on the shelves in our supermarkets. I visit north of the border often and whether I'm in Derry or Belfast, or frankly anywhere up north, I always go to the supermarkets and pick up gluten free products I just can't get in the republic. Why is there such a HUGE difference, when literally we are just an invisible line away from getting our hands on what the residents of the UK can get for their gluten free diets? There is a two edged sword to this, though. As Ireland has one of the biggest coeliac populations, there is a great need for access to gluten free food and a lot of talented artisan businesses spied a gaping hole in the market and have started to cater especially for those who need to live gluten free. So as a result we get some incredible food businesses producing amazingly delicious coeliac friendly handmade and homebaked foods. The Cake and Crumb, Gookies, The Foods of Athenry, The Gluten Free Foodie, Pure Foods, Big Red Kitchen, Bakery Union, Glór Gourmet Foods, Nutritious Nibbles, Natasha's Living Food, The Gluten Free Kitchen Company, to name just a few of the amazing people and businesses out there doing their bit to provide for us gluten intolerants and coeliacs. 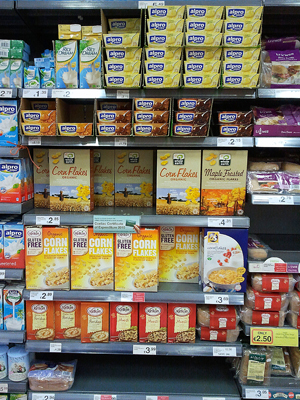 However, the other side is that in the supermarkets, there is very little choice for the consumer when buying gluten free. The two big brands that seem to dominate the shelves are Kelkin and Livwell. Tesco, M&S and Aldi have their own 'free from' brands. SuperValu have a large free from section and stock gluten free food from local food makers and bakers around the area they are located. This I think is great and is really very supportive of the local Irish food scene. That gives them a big thumbs up from me. I bake and cook a lot from scratch. As a person who is gluten free, it's what I have to do. My point is, sometimes I'd like to just go out and be able to pick up the odd pre-prepared meal or dessert for the sake of convenience when I'm grocery shopping and have a variety to choose from. Just like anyone on a 'normal' diet can do. 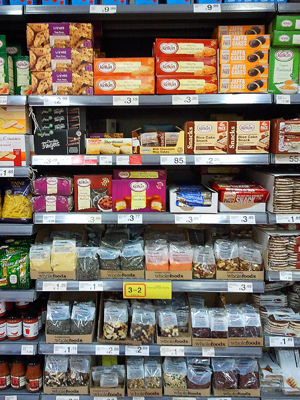 So where is the convenient gluten free variety on our supermarket shelves? If it wasn't for Eco Direct the gluten free shop that's online, it would be even more difficult to access a large variety of gluten free foods. It's shocking that so many GF companies seem to be passing up the opportunity to provide for a population in need. Is it that the supermarkets/shops, such as Dunnes, Tesco, SuperValu, Superquinn, Centra, Spar, etc., have a cost hindering them from picking up new free from brands? Is it a tax thing? Is it a lack of education on the shops behalf about how in need the coeliac population is for accessible, tasty, GF food? Things do slowly seem to be coming on to the shelves. I can now pick up Bob's Red Mill Rolled Oats in both Dunnes and Tesco now, but that only took a few years for that to happen! The emphasis on the S L O W N E S S of getting a new GF product on the shelves, UK made or otherwise. Why can't the supermarkets, like SuperValu, all try and encourage locally made delicious GF products to be available in their shops? I'm tired of trapsing around from shop to shop, market to market, county to county (or country to country when I head up north!) for delicious GF food. Though, I do love going to farmers markets and gourmet food emporiums, I'm just talking simply in convenience terms here. Access to 'normal' food hasn't stopped the traffic of people with 'normal' diets to farmer's markets, artisan bakeries and small shops, yet they have the luxury of both worlds on such a bigger scale. Perhaps, I'm the only one who feels this way, but I personally think that there shouldn't be restrictions on choice when a coeliac diet already has restrictions enough to deal with. Examples of Free From foods found on supermarket shelves. These are taken on my phone, so apologies for poor quality.